Suspected of aiding a serial killer, single dad Chase McLear is desperate to prove his innocence. However, someone's determined for him to be found guilty - and now they're targeting Chase's little girl. Preschool teacher Maisy Lockwood's father was one of the killer's victims, but Maisy believes Chase has been framed. Can Chase's K-9 beagle sniff out the evidence to clear his name before the killer makes them his next victims? 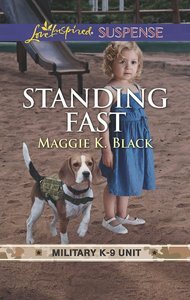 About "Standing Fast (Military K-9 Unit) (Love Inspired Suspense Series)"